Two days ago I discovered my lung capacity is down to 67%. At present I am taking a new promising medication that will not reverse the effects of Pulmonary Fibrosis but in many cases has arrested it. In the early 1980’s I was prescribed a medication that promised to bring relief to Myasthenia Gravis however it lead to 12 hip surgeries. While the new mediation for PF is good news experience has taught me to ultimately place my hope in God’s power to protect me not in “stuff” developed by the minds and hands of humans. While I draw strength and expectancy from the new medication to help keep me going when I get short of breath my hope for an abundant life is based on my faith in God. That same principle applies to all of us. We can draw strength and expectancy from worldly and human resources to help keep us going when the going gets rough but our hope for an abundant life is based on our faith in God. 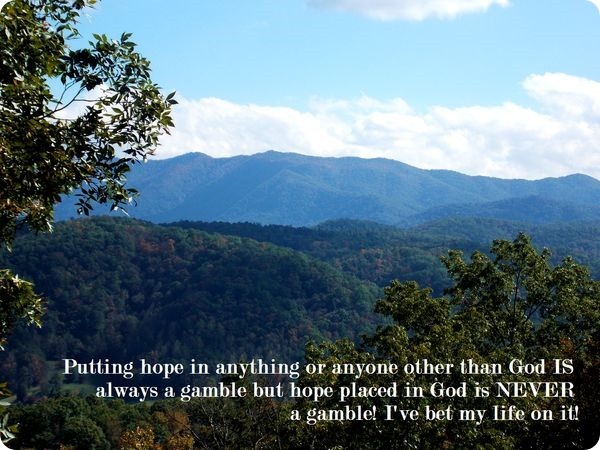 Putting hope in anything or anyone other than God IS always a gamble but hope placed in God is NEVER a gamble! I’ve bet my life on it!